marie: i can't believe autumn is upon us, again. the year has swooped past in a whirlwind. it's finally time to breathe cool air, take walks, watch the leaves fall and wait for the arrival of baby k.
naomi: this is one of my favourite tlp's that we've done. i love autumn the most. i think this project is affected so much by the seasons that sometimes we don't even notice. in spring, we're both obsessed by cherry blossoms. in summer, we both love nothing more than moaning that it's too hot. 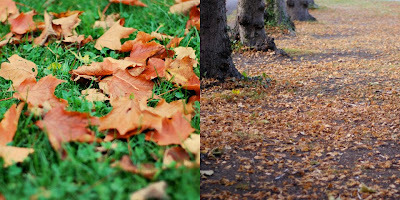 in autumn we're engrossed by the fallen leaves, and come winter it's a snow lovers paradise. marie's winter is going to be something else entirely this year because she'll have a baby boy to distract her from all the snow so i'll have to do double the snow-watching. hopefully i'll make it to america to meet him though, so maybe i won't even notice the snow at all. next weeks theme is uphill, set by naomi.